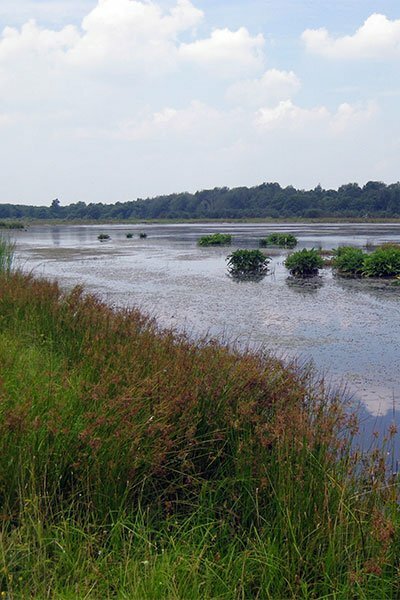 Wet meadow & wetland sites have soils made up of clay and high organic matter, with high water tables or impervious layers that prevent drainage. They are wet most of the time. Examples of wet meadows include roadside ditches, retention basins that catch run-off water, pond areas or wetland edges. 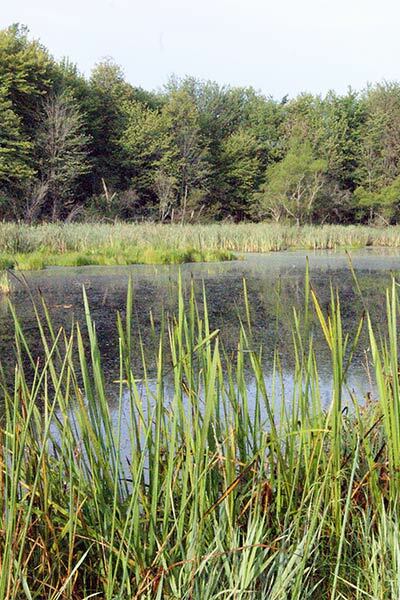 Wetland examples include newly created wetlands and wetland restoration sites, retention basins with wetland functions, floodplains, pond edges and open water or wet bioremediation sites. Varies from partial shade to full sun; requires wet or saturated soil, standing water or a high water table; generally occupied with OBL, FACW and FAC species. Due to the potential for water contamination, lime and fertilizer are not recommended; however, we do recommend the addition of organic matter (compost) when topsoil has been depleted or removed. Check your soil pH and select species adapted to that pH. Hand seed, broadcast seed, hydroseed or drill seed when the water table is drawn down. It is not practical to seed any wetland when the water is more than 2” deep or where severe flooding is likely to occur before germination. The same caution applies to mulching. Natural seed banks (seeds in wetland soils) often establish part of the vegetative cover. Eradicate existing invasive vegetation by having a licensed spray technician apply an approved herbicide, such as glyphosate (Rodeo®), triclopyr (Garlon® 3A) or other aquatic herbicide formulation, to control undesirable vegetation, such as multiflora rose, honeysuckle and woody species. CAUTION: Some persistent species, such as purple loosestrife, phragmites or reed canarygrass, may need multiple applications of glyphosate or triclopyr. Perennial weeds not addressed before establishment will be more difficult to remove later. The soil is often too wet to till. Newly constructed wetlands, retention basins and wet construction sites should be seeded as soon after construction as possible. Leaving the surface rough by creating mounds and kettles for an undulating microtopography can be very beneficial in obligate wetlands. When feasible (the ground isn’t too slippery or mucky to safely walk), post-planting maintenance will provide the best results for wet meadows and wetlands. Whenever canopy (overall vegetation) reaches a height of 18”-24”, use a string trimmer to trim the meadow to a height of 8”. 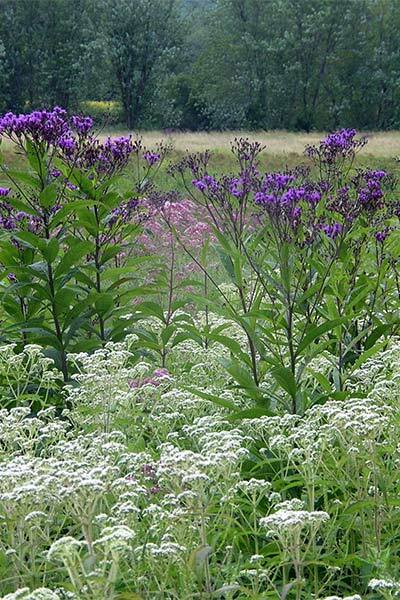 This will reduce competition by fast-growing weeds for sunlight and nutrients needed by slow-growing perennial natives. Mowing should cease by mid-September. Problem weeds should be hand pulled or spot sprayed with an approved aquatic herbicide (such as Rodeo® or Garlon® 3A). Problem weeds, such as phragmites, reed canarygrass and purple loosestrife, should be hand pulled or spot sprayed with an approved aquatic herbicide (such as Rodeo® or Garlon® 3A). The following mixes are good for vegetating disturbed or man-made wetlands. 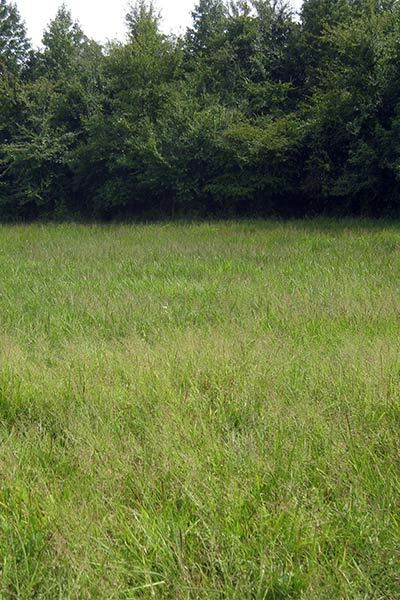 The species in these mixes provide food and/or cover for insects, birds and mammals.